representative, Alex Skalazub; and my US students: from NY, Richard Kelly; from Arizona, Ashe Higgs; from New Jersey, Dr. Wai Tang; from Pennsylvania, Dr. Nancy Watterson. I believe that most of you guys here have learned some kind of Martial arts, yes? Majority yes. Then, we are going to talk about martial arts, self-defense or about movement of physical mechanism. And about how mental and physical coordinate. The system I have, we call it Zhong Xin Dao I Liq Chuan, and it’s based on Zen philosophy and Tao. Zen and Tao philosophy is talking about nature as it is. It’s about how things are. So, it’s an approach of seeing Nature itself. So, we talk about the Moment, the Present. First of all, we want to understand what is the nature, what is the characteristic of Nature. Then you only know what kind of approach. The characteristic of the nature is change and it doesn’t have solid entity. That means everything is based on conditions. You need things to be there so that condition is formed. So, if conditions is not there, it just cannot be formed. Then we talk about what kind of quality you need to be with the change. That is what we talk about the approach of Zhong Xin Dao. In Chinese Zhong is center—you can also say middle, but you also can say neutral. Xin is the heart. Dao is the way. So, in the middle of the heart lays the path. Then what is neutral? Simple to say: you need to be able to change with change with the moment. So, neutral also has the quality of formless. Formless—it means it can change and adapt. The most important part here is that everything keeps on changing, then how can you know? point, present point, neutral point. To know and to change. Let me give you an example. So, we need to understand first, what is knowing? How can you know? Everyone says that they know; how can you know? Your knowing is based on what reference? Everyone knows. Everyone knows differently—why? present (I see, I touch, I know this from my experience—that means that is not present). Normally, everyone says that is his present: because I hear and see—that is my present. But in Dao and Zen that is not present because you use your past experience to know the moment. That’s why we talk that this is ‘judging’; then, here that’s why everyone knows differently. The nyou can say everyone is right also because it’s based on their own viewpoint. But practically speaking, everyone is wrong. Yes? It cannot be right. If you are with the present to see the moment by itself, everyone sees the same: because nature is only one thing. That is why we call that the Way Things Are. Alright? Or, in Zen we talk about this as Suchness: it’s Just Like This. So in order to understand the moment of that present, it’s just now what I say: everything changes…but there’s one balance point within all the change. So sometimes I use the words like ‘change with the change maintain not to change.” That is the balance point. That is the present point. Only that present point will you understand from there you then connect. In the present of the moment you can know it only through DIRECT. When you can hold on to direct here, not falling back to the past experience, then normally people would say ‘oh you have concentration here; oh, now you are connected. Through connecting and steadying and stable and balance. . .from here we talk about the clarity comes: from knowing the clarity, what is clarity? How can you describe clarity? Sifu asks: based on what? You see that’s the problem here, to maintain here. Tai Chi talks about One is born two, two born three, three the thousand things are born. One is Wu Ji, two Tai Chi, three: yin and yang. That means what? Three is the separation that also unifies. Only by understanding separations and unifications do they give you the difference. It’s the difference….it’s not opposite. Difference has separations, has unifications, and they have the relationship; and the relationship has cause and consequence. Cause and consequence has cause and effect. You know the moment by cause and effect. Yes, it’s based on the pixels. So the higher the pixels the clearer the picture yes? Because of the separation and unifications, they make it clearer. So if you can understand here in the moment, it’s based on this idea. In tai chi it’s said 1 to 2, 2 to 4, 4 to 8, 8 to 16, 16 to 32, you keep on breaking down. Provided you can be there…Yes? Then, we say if you can be there that means, as some say, ‘concentration.’ But by right there is no concentration because by understanding the nature you cannot add, you cannot take away. That means you cannot interfere. That’s why in tai chi they talk about bu di bu ding: no resistance, no backing off. That means it’s the flow, yes? Flow, if you understand it, flow is present. Flow has a stillness point. Flow has a present point. And has a neutral point. Put your hands together: (this is changing: move your two hands around, fingers touching). But this point (of contact) doesn’t change: the pressure maintains the same, though you are changing. You are changing with the change not to change. This is the present point. Until you understand this point…this point is where you connect. This is the principle where the present understanding of these principles that connect with the moment. From here, you only recognize and realize. But do you understand what is ‘recognize’? HOW can you recognize? [ answers: comparing different things] Many people think they need the past to recognize. No. To recognize is knowing what is happening that happens. Understand? That is the moment of seeing the difference, seeing the change. So, this is about knowing what kind of reference you use. That’s why we talk about when you are present, it’s based on stillness and clarity. Before here, then we talk more about this: how can you know? What is knowing? We already mentioned that after you know, you use that kind of reference—the PRESENT reference. We must know HOW to pay attention in order to know. Alright? In everything is based on Point of Contact. You know from point of contact. You act to the point of contact. What, then, is Point of contact? We have five senses point of contact: Eyes for form, Ears for hearing, Smell, Mouth for taste, the Body for Touch. But point of contact must have 3 things, in order for it to be established. The 3 things are: Object, Subject, and Consciousness, or else you have eyes but can’t see and ears that can’t hear. That means attention must be there. That’s why in Tai chi they talk about Yi Chi and Li. First, attention must be there (yi), then energy will be there (chi), then the action (Li). Alright? So yi chi li. In order to have the right attention where do you see me sitting here? Where do you see me? (in front of us. No, he laughs). No, YOU see me in your own mind/eyes (points to own head). To have Right Attention you don’t see me here. I am only just a REFLECTION. If you see me here, you have INTENTION. What is intention? Intention means you already are going out. That means you’re trying to ADD something, adding. That means if your attention is out, you cannot be ready. When we talk attention, when we talk about awareness, readiness and alertness must be there. If my attention is out, then when I want to act, then I need to bring back my attention—then you will have in and out. attention cannot hold more than a few seconds—it flies out every few seconds. Alright. So this is about how can you know. In philosophy, concepts, principles everything must align with that. Philosophy is about the nature itself. And to understand that is only through recognizing and realizing. Because it’s already there. Because you cannot imitate or accumulate. And in concepts actually we talk about there’s nothing to learn: it’s there. Yes? So, why can’t we see there? Why can’t we know? It’s because our past experience, our habit, blocks our view. That’s why in Zhong Xin Dao we approach with the neutral view. And in Principles, we talk about the past and the present. With the past experience we have only 3 kinds of feelings: I like, I don’t like, I don’t know. This is the past. If you have these 3 feelings, you are already in the past. Present is only stillness and clarity. So, this is the philosophy, concepts and principles. From here we talk about Mental Neutral and Physical Neutral. Mental Neutral is to understand what is concentration and what is awareness, so this is about how to be mindful. And physical neutral starts with 1 point. One point that separates: one to two, two to three. And a point is also a neutral point, a center point. What is the quality and what kind of condition do you need in order to say a center? A center must have forward backward, left right, up and down. So the center must have 6 directions and 3 dimensions—then this is the neutral center. And also a junction point. And also the Fullness Point. Form here only can you change with change. Now, a point must be strong, and it’s also a pivot point. What is the quality of the pivot point? To have action you must have a pivot point. Without the pivot point there’s no action because a pivot point gives yin yang, and if it’s not strong you cannot give direction. A direction comes from a point. You guys understand here? Why point gives direction? You need a point to give a direction, since direction is an angle of movement. So you need a point to give direction. What goes out must comeback. What goes out returns, not reverse. You must understand my words here: return and reverse are two different things. When you return from one point you stretch to the other point; you hold onto this point and return on this point: you complete the cycle. When the cycle completes, you have no gaps. And you have no beginning and ending. It’s only a matter of what moves and what supports. If a point to another point reverses, there will be a gap. Q: when he hears a reflection from the point, then he close the gap? This is the skill of unifying from center to center. Then you have the information transfer. In martial arts they call this Ting jìn—listening power. If you only can stretch only to this one room, this big, and connect but if I can then connect as big as this whole campus, this university, then insider here (this room) you know, but outside you don’t know. But outside is under my area, yes? That means outside is your future. So, your future is under my present. So, you cannot be faster than me. THIS is Ting Jin [heightened attention]: it’s how you expand your attention, your listening power. Or, you can say it’s the Awareness. Today we will emphasize our principles and philosophy, the way of our approach, what the students need to really look into and how to maintain it. As we said, there’s only two processes: one is the present, one the past: the training is to recognize if you’re using the past reference, to recognize you’re using the present reference. It’s through the method of holding, maintain. That means we give you a reference to hold: and where to hold and what to hold. From here, this is the training of concentration because you have to maintain and hold; to recognize from here the difference of holding as reference: from here, what can you notice from here? If you can’t hold, can you notice that your attention has been shifting away? If it shifts away, you’re using what reference? When you’re shifting away you’re using the past reference. Now, from here I want the student to be able to differentiate these two reference: past and present. What ‘s the feel, what are the the things you’re able to know from the present reference and what would be the feel of when you’re with the past reference. In our Zhong Xin Dao path of ILC, if you’re using the past reference, we say that you’ll be using the feel of “you like, you don’t like, you don’t know.” With the present reference, you’ll have the feel of stillness and clarity. But stillness and clarity: what’s the feel of that? When you’re shifting away you’re using the past reference. Can You See Your Mind is Engaging the Past? The past reference feel (you like, don’t like, you don’t know), is easier for you to understand. So, these 3 kinds of feeling from the past are all based on past experience. But the hardest problem is, can you see your mind’s mind engaging the past? We are so used to it we normally don’t recognize it. And because of that feel, we’ve been so used to it, that that’s how I am—that is who I am. What’s wrong with that? So people will say ‘oh, there’s nothing wrong with that, you see?’ But the student doesn’t really understand that this view is the accumulation of past experience that has built who you are, what you think of as your identity, but it’s NOT THE NATURE OF YOURSELF! So, first—convince yourself. Do you agree that you are being accumulative—that that sort of seeing is accumulative—what you think you are now, what makes you what you are. If you’re not convinced then you’ll stick with yes, ‘this is who I am. Firs you recognize that this is the experience of accumulating habit. If you don’t agree with that, then it’s hard to change. It’s because of here, everyone says ‘this is who I am,’ when we’re using this type of reference; then, this sort of reasoning only comes down to who has a better experience; who has a better past—if you use that reference. Yes, in Tao and Zen, no doubt you need this past experience to recognize SOME of this process, in order to show you the way. But if you agree with that, then you see this is the process of BUILDING a habit form past experience—this is what people usually address. But, if you come back to the NATURE OF SELF—then you’re understanding the nature itself is THROUGH THE MOMENT. We are using that moment to know and to change. That moment to know is so short, and so fast—that moment of PRESENT. How can you know with that instant moment when it changes so fast? That’s what seems so impossible to do. We used to say your foresight is so close—that you can’t see further. If I want to see further, then I need my past or experience to see further. If I don’t use the past experience to project further in the future, then how can I see, how I make it longer? Yes? Then what is the difference of being in the moment that you can see so far, so BI? What kind of method. Being in the moment is so short. That’s why it comes down to the MOMENT OF CONNECTING. THE MOMENT OF STRETCHING. THE MOMENT OF LINKING. The moment of connecting is so you can see big. Otherwise, you’ll just be one little speck, one little dot. In that one little instance, if you can’t connect you won’t be able to see the bigger picture. With that very small moment, it’s very hard for you to make decisions, or for you to act, or for you to act—and know correctly. That’s why I keep on saying that knowing is through STRETCHING, it’s through connecting, linking. But that linking is also one moment: like 1 slice of picture…one slice that keeps on maintaining to see. But it keeps on changing to see. That linking, connecting is based on that balance point. That flowing point continuing to maintain the same, because of balance point to maintaining the same to see–only from this can you have the clarity. The past, present, future—has past experience. And if you want to predict using the past experience, then you can say (ah, they are doing something, I can predict, I can plan, that means I can make a long plan…. But you’re suing a past ref). in order to do the same thing using the PRESENT REFEENCE, it’s by doing it form ONE point that you can stretch, that you can connect form center to center, form one joint to another joint—that you can connect. You can say that’s also past, present future—but in one instance. It’s so hard to explain here. The base of attention (is awareness—like a space). How attention comes—it pinpoints. Attention: the base of attention never comes and goes. In our reference with our attention (sometimes we make it on this or this), but the base is attention. WITHIN the attention we have jumps (this to this); when it jumps, we call this past, present, future, but when you STRETCH-the past present future are all in ONE: you still it PRESENT. So, your present is a bigger present. Like you drive a car…and in front of you there’s so many cars, for instance. but you don’t see based just on the car in front of you…you’re not just looking right ahead: if you can look further ahead…5 cars in front of you making a brake, you’ll see that). Example: sensing line: sensing can sense 180 degrees instead of only 90: it’s range and scope is vaster—the area is bigger). Same function, same instant. So, on the point of contact, can we do that? Within our self, can we do that (that stretching)? Yes? In order to do this first, you must be able to hold and maintain from ONE first. If you can’t do this, how can you for the 2nd, or 3rd, 4th, 5th. You have no way. That’s why this called ONE Pointedness first! This is how in meditation, too, the process of meditation works: able to hold one here first. And holding here ONE first! In the process of maintaining, you start to see what comes up to disturb you. When you see what’s come up to disturb you—it’s all your memories, all your past experiences. This is what you call meditation: to increase your attention: to see that clearly. And to see that that has been built up things. So, in the process of training, we are using the reference of the POINT OF CONNECTING. 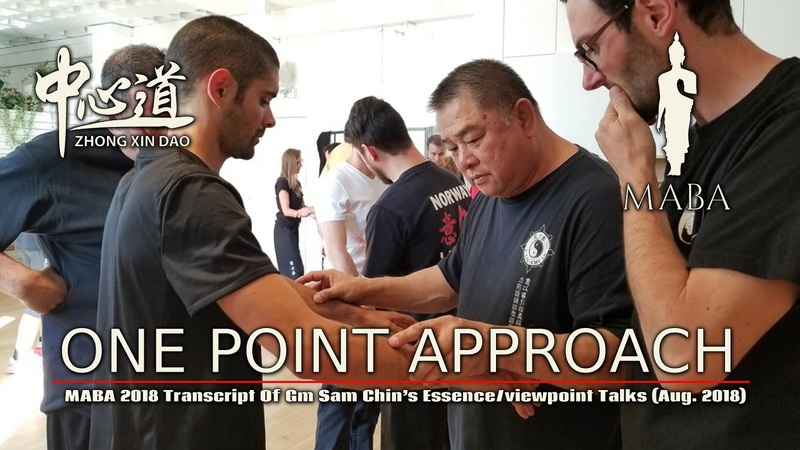 With the point of connecting as a reference, we need to know to be able to maintain a point that is a center point! A center point is a neutral point. A center point that can change with the moment. That is changing with the moment. With the changing of the moment, that means the point itself is a present point, is a balance point. *When I say ‘the present point is changing; a balance point is changing.’ That means in order to change you must be balanced: because the balance point is the changing point. So we’re training to look into the Quality. We train the point to see the quality. To maintain the quality. That’ why we say how we train first how do you train the center? How are you going to train the center point? Yes? You can say I’m training 6 d to get the center point, because the center point needs to have the 6d. to have a center you need 6d—but how do you train this? Then you want to train forward backward, up down, left right in 1 INSTANT: not trying to do each separately. How to train ONENESS. Now I’m training to explain the FUNCTION of quality. In order to train a center to have six dimension, it’s first about condense Expand has 6 directions: you do it together (simultaneously!) you can’t train separately and have a center: if you separate out or make distinct, but you’re not holding: EXPANDING AND CONDENSING together. That’s why we have the ex of Condense Expanding. The characteristics of holding the center is through rotations: that means you’re doing the center also—to do CE: FROM ROTATION. That means the actions of movement are up down rotate to have condense and expand. With CE with rotation you must be able to see the direction of forward backward, up and down. Understand here. Q: so, your entire being becomes the REFERENCE POINT yourself. I’ve had that experience while meditating but not while spinning hands. A: that means while spinning you have to hold onto the feet—the Center of Gravity because that’s where the center point is established: where the feet/ground is 90 degrees o the mass. That is the firs center point! So, center point with rotation, condense and expand. With CE you have to see the 6d and the 3d. because of THESE references, we form the alignment: everything that goes out must return back to here; to this center point—this center point that forms the alignment. You must hold on here to connect and stretch out! So, is your attention begin placed over here to hold, or not? Or, are you being unable even this instruction to train—within a few minutes are you doing something else already? These are the things I want you to work on. Actually it’s so simple [but it’s not easy]. You have to convince yourself first—otherwise you won’t know if your mind is running off: to play and use a different reference. If your mind runs off to use the past reference can you catch it? Doing something else, more free is fine, but are you using this connecting reference or not? Only by maintaining and hold can you ‘stretch’. If you can’t do this kind of stretching and connecting, so that if your mind shifts off, you must know—and bring it back. Actually, you can say—that’s ALL you need to train. Q: is what you’ re referring to sometimes referred to as being ‘caught’ in the moment. I was in an ashram and my teacher suddenly said something and I suddenly became aware that I was in the very process of taking a step; I started to count 1,2,3,4,5 –and my foot wasn’t going to the ground. I was suddenly aware of everything in the moment. I do that in meditation, but there’s no reference… but I haven’t had such a level of awareness/clarity while spinning or working with a partner…it hasn’t happened. The strongest energy that reaches to the point of contact, I’ve already knocked it off somewhere else—I’ve already taken it away already! All the training is based on this. That means, connect: how many centers can you connect. The furthest center I can see—I can neutralize before it reaches the very last Point of Contact, because I’ve already connected so many centers. That’s why we train to say on the join we need to condense to have some tension joint-by-joint to feel: can you feel every joint? For joint is also where you have the separation and unification. So you can reel every joint of opponent—and his unification and separation. In order to connect, you need to link it and pressurize it. If you can’t pressurize it, you can’t link it and neutralize. That means the pressure from Point of Contact through each joint must be the same pressure in order to connect. If you can’t do that, you can’t connect. Q: do you have to link and the pressurize? A. Sifu: you have to pressurize to link. To link you have the direction to connect first…but if you have the direction to connect but you can’t hold. So, in order to HOLD you need pressure. So, I can align but not also pressurize it along the way. So you have to be able to COORDINATE aligning and pressurizing. The problem is…sometimes we align with the curve. So sometimes it’s harder… that means we need to pressurize every separation… by our yin yang muscles. Because our body is made up of bone , ligaments, tensions and yin yang muscles. Sometime you can just align and hit one time but you might be able to maintain. Yes, you can keep on one balancing and aligning—that’s ONE kind of linking. THEN, you add on the ability to PRESSURIZE it too, to connect. You pressurize to unify it. So, when you can release the pressure, it disconnects; then, pressurize it and connect back. If not aligned, can’t even begin to do this. So, after aligned the pressurizing MAINTAINS. So pressurizing is the process of how to maintain. **What we are working on first is center-to-center to connect. First c-to-c to ALIGN to connect. Then, once you’ve achieve that, PRESSURIZE it. There’s 2 interconnected processes: the first is aligning. So the exercise looks at aligning and then APPLIED TENSION. The tension you apply is to pressurize it. From these, pressuring and everything with the constant changing—the constant changing requires a balancing. We need to balance it in order to hold. Balance gives us the different directions. This is the training of how to go about maintaining the balance point by producing different directions. When hand goes in, one energy out. When hand goes up, there’s one energy down. THIS is the balance point to hold you need a point to give a direction. Q: the process of balancing itself gives the different directions…to maintain the point. When hand goes in, one energy out. When hand goes up, there’s one energy down. THIS is the balance point to hold you need a point to give a direction. Then, later on, it’s about producing a strong point, a pivot point. The fish can have no direction [Sifu elaborates example The direction of fish head/tail… [ex. of the plane landing sideways]. **So, I want to see students working on this quality. If you’re not working on this quality ten you don’t know what are you doing! That’s why some ex on spinning we call you to grind the point; because grinding the point has a quality of skimming. Grinding has a spiking kind o energy: you need to maintain a point….grinding you need a center to grind. Can’t grind without. [where is it going TO and what are you holding)…otherwise slipping. Grinding need a 90/pt …. Grinding [like old grinding of rice or soy beans: the stones grinding] The grinding produces multiple direction energy. You must have equal energy here to move. Too much energy in one spot and you get stuck: can’t grind. Sifu: you have to balance. In the Oakland workshop I said that the tire is a very good example of the connecting point: the flow, fend, roll, and pivot. The first thing you need to maintain flow is the 90 degree to the center at Point of Contact. Rolling is the changing of the point at 90. The 90 degree is also a pivot pt. An example of the tire is that the tire is always 90 degree on the ground. This one point is the fending energy (which means that 90 degrees is the maximum point): defending: nothing can go through here. It can’t go through, as if I have a shield here, then it’s fending: defending. When this 90 degree changes into another point, it’s called ROLL. But Pivoting—that means that moment of the function OF ROLLING, when you’re holding that point, it’s called pivot. If that point skips, the car won’t run. If that point doesn’t change, then it holds, and the car moves. That MOMENT of holing (form one side to another side—before it changes to another pit) is called pivot. Once it changes, it’s called roll. And maintaining that point all the time it’s calls A BALANCE POINT. It’s ALWAYS A NEW POINT, but the 90-“degreeness” doesn’t change! That is called maintaining—it’s called balance point. That function of maintaining is called balance point: that’s called flow, fend, roll and pivot. Q: when the point is pivoting before it’s become another point? Rolling and pivoting is so fast—the rolling and pivoting at the same time. IN that moment in between the point and the changing of the point it’s called maintaining. Q it seems when you’re not holding [gravity force is always there, dropping the 90]? Yes, in training, the action is to hold the tension over there; direct force (gravity dropping down), that’s how you maintain the CURVE. That’s why in training we train to meet the force directly. The force directly means the force will come from the structure: it will still come from the bone. So, all action will be from the bone. It can’t be somewhere else. Q: when you’re talking about aligning to pressurize and connect? If you align you can STACK UP (but ‘pressurize’ means doing it evenly) … energy can still go through, but without pressurizing may NOT BE ENOUGH. Q: how do you connect with me before I’ve connected with you? Sifu: if you’re not pressurized by yourself, you’re not aware, so your consciousness is not there. And your consciousness hasn’t yet been established. But, for me, I’ve already established a Point of Contact. [like flat tire: tire has to be pressurized across the whole tire—the structure—if not equal, you’ll slip]. So the person with awareness. The pressurized tire knows everything. **I Know You BETTER than you know yourself! Q: is that the definition of why movement is even possible. If there’s not hot and cold there’s no wind: because there’s not transfer, no complementary, no ‘change’. [It’s all relational]. That’s why if body builder does too much, they’re too stiff! This is your body. If awareness isn’t there yet, you need to train and work on this! Object, subject, consciousness. That means there are 3 things in the body or else there’s no Point of Contact. Because if I connect with the opponent, then I have the POC. From here, hopefully we can come up with a list of the what you need to work on. You can see that all points back to one thing. How to teach how teach how to learn how to teach. The direct experiential feel. this morning I talk about the function, the conditions, how you look at things. The base of macrocosmic orbit. The direct feeling and experiential feel of that moment of how you approach rather than just empty words. Constantly adjusting, constantly maintaining, constantly changing: this is what permanence is: impermanence. Change is constant. Your own maintaining doesn’t change, so your opponent cannot change you. Learn more with one of our video products below! We have been here [at Mid-America Buddhist Association] for the past 6 days. So, what have you guys learned? [Looks around]. What is the most important part that you are here for, first of all? Yes, mindfulness. Another word for mindfulness is the purpose is to have DIRECT. Direct experience. Direct experiential knowing of the moment. Yes? So, the same thing as we do training (in ZXD); that’s what the reverend (Ji Ru) talked about. Practically, we don’t need to remember. When you ‘remember’ things, that means you try to get things from the past. If you want to use things you ‘remember’ on, that’s from the past. So we talk about the past and the present. The training of present is direct! Direct doesn’t need to remember. Here is where we try to understand what is it that is direct, that there’s no need to remember and we still understand. What is there that you’re able to see and how can you know in that direct moment? How can you act with that direct moment without using the past experience? Here is the toughest thing. Because every moment if you can’t hold onto the direct moment–say you need to penetrate, you need to connect—if you can’t do that it will fall back to your memory, you will fall back to your past. That means according to your past and falling back to that kind of senses contact, the past experience, those are past senses and past experiences: what you like, don’t like or what you don’t know, the 3 types of feelings. It’s coming from stillness. Stillness is the concentration. It’s the present point and also the balance point. Because of the concentration, because of the power of attention that you can hold, you are not being stirred up by past feelings, past emotions, so you won’t be stirred up like that. So, you won’t be using the past experiences to judge. (When you use past experience to judge you always fall back to: What I like, I want more; what I don’t like, I reject, or what I don’t know). Because of the concentration, if you can hold, that’s where the clarity comes. With the clarity you have that kind of peacefulness. With clarity you get satisfaction and joy. That’s why the next two [qualities] are joy and equanimity. With equanimity you have the balance: the peace of mind. This is only 2 of the kinds here. In our system we normally call it as past and present: present is direct. In 2014 I called this the I Liq Chuan Path and now we name it as Zhong Xin Dao (ZXD). You guys understand? — you need to follow this path. The first topic we talk about the philosophy, concept, and principles, because you need theoretical things at first to guide the philosophy. The first part of the ZXD philosophy talks about how we are using the Zen and Tao philosophy. Because for every system, if they use a different base or different philosophy, their training will be different, and the outcome will be different. Because you’ve got to be aligned: know from what kind of concept and what kind of principles for how you train the philosophy—ask what is the philosophy that needs to come out? So every time you need to look back to the philosophy. First of all, the Philosophy of Zen and Tao is talking back to the Nature itself; everything is going back to its nature to see the nature in order to see the truth. So we ask: what is the characteristic of the Nature itself in order to see? First, the characteristic of nature is change—that’s what Buddhism talks about impermanent. And no self: we don’t have one solid entity —it’s all by conditions that combine to form. You can’t be one; there must be two. That’s why the Tao Te Ching talks about: the Tao that born one, one that born two, two that born three, and then everything is formed. [From here is the way you approach and see things—to understand things. Lately, I try to talk about this because to understand things, you must always see from different angles. Recently, I heard one of the talks on a TedTalk called “The Danger of One Story.” When you see a danger of one story then you think “oh, this is what it is, it’s just this—you have to be able to see through different angles. So, a lot of the words we use will get you stuck, will block you, will jam you. When you listen, you must check it from different angles: sometimes words like center: a center is what? When we say center, a center must have 6 directions; 6 directions is a center. Because when you look at 6 directions there is a center. If a center doesn’t have 6 directions, it’s not a center. Or you say a circle must have circumference. Or, you do a circle without centers, then if the circle doesn’t have a concept or principle of a center, that is not a circle. They always have relationship to form this. So a center is a junction point. A junction point is because it’s a center: the junction point has the ability to go in all different directions. If it has that ability, I call that neutral. Yes? maintain not to change. Here is where you know the change. Here is also HOW you know…and WHAT you know from here. So training, if you can’t connect and hold over here, you will fall back to your memory, fall back to your past to judge the moment. Over here, if you can hold and link, we say that there’s nothing to remember, because you act in the moment of connecting and matching. That’s why we come up with the Meet and Match, from here. That means that everything is also from the point of contact. We know from the point of contact and act from the point of contact, but here is where the 2 things at the POC: are you present—to connect? —or, do you fall back to the past, memory to judge, or do you act on the point of contact. That’s why here, on the philosophy side we talk about the nature itself; the way things are. Then sometimes we talk about the characteristics of the nature itself is the way things are—things as it is: that means you can’t add anything, you cannot take away anything. If you add or take away anything you interfere, that means you are not with the nature, you aren’t understanding the nature. But that doesn’t mean you cannot change. So, by understanding the conditions you know how to approach. In the Zhong Xin Dao Path here I make it simple in a way, so that the concept, ‘there’s nothing to train’ is to remind you to see things as it is, not to ‘remember’ anything: it’s direct. The most important part is that the training is not to accumulate or imitate. Your training is through recognizing the moment: recognizing the moment and realizing what is. Recognizing: what is recognizing? Recognizing is seeing what is happening that happens—at that moment that’s called recognizing. It’s the change from seeing here to everything else: all these days this week we’ve been talking about this ‘falling and raising [arising], fall and rise is the change. So we say that the learning process is only to recognize and to realize. In principle, it’s only so you can understand what is the past and what is the present. The past, you’ll fall into the feeling of ‘you like, you don’t like.’ So, approaching the present is stillness and clarity—but it’s direct. Stillness and clarity that means it’s the connection of being direct, and being in the moment with the balance point. The balance point is the change with the change that doesn’t change. So when we come to action, then how can we recognize the balance points. You see, the balance point on point of contact is on physical and on our mind. The balance on the mind is about the concentration, to hold. It’s mindfulness. And the balance point is about center! When we say center that means it must have 6 directions and 3 dimensions (3d6d) to be considered a center. We talk about center we have your center, opponent’s center, environment’s center, and a point of contact center. First, we talk about structurally, unification of your center. Structurally—unification of your center—we have structure center: sometimes we call it Unification of The Self. Unification of the movement (the balanced movement) and the Balanced point of contact: they all have a center with 6 directions-3 dimensions. From the center, what kind of center we use—there are so many centers. First of all, we talk about our own center: where does our own enter come from? How is the center formed? First, it’s the gravity: we live in this world so the first thing is the gravity: everything has to related to gravity. How to build a building, how a tree grows, everything has to deal with this? Because of this gravity and then every object has a mass (the camera right there has a mass, the table, a car, our body has mass). Right? So, with this mass and gravity the relationship forms the alignment. Alignment is where the balance point is, it’s where the center point is. When we say balance point it means it has direction…and from the balance point only can you settle down and relax. And then all actions are from this balance point, this axis, this One point that goes out and returns! When we say One Point, one point is what goes out and returns—it doesn’t reverse. Return is a cycle; you need to do the complete cycle. When you talk about connecting, linking, you talk about direct, you need to connect to get the information: coming back and going out—it’s a cycle. So when the cycle is complete, then there’s no more beginning and ending: that means you are always there. Like paying attention to yourself, in the body: the cycle is complete. So, when you connect to others, the cycle is complete, too: you are always there. When we say present, you are always there. So, when you are present and always there, there are a lot of other qualities. In order to be present that means you must change with change, yes? To change with change, you must be able to flow. To be able to flow that means you can’t resist and can’t back off. If you resist or back off that means you can’t flow. So, you can say this is also a balance point: Example: put your hands together [move them around] this is changing, but on the point here (where they touch) they connect. This point that connects doesn’t change. The pressure doesn’t change, the point doesn’t change, but you are changing: this is what we call the balance point: it’s a flowing point that is changing with the moment. So, from here you know. From here you see the change. Another thing we say is Meet and Match: on holding the point, how can you know? Like we always ask: What is knowing? And knowing based on what reference? On point of contact, we always talk about a point is a center point; a center point means it has 6 directions. (up down left right forward back). We talk about using the cross first; when they cross there will be 3 points. (1,2, 3, points). A point must have 3 (1 born 2, 2 born 3: 1 must have 2—that means yin yang; 2 must have 3–the 3 is the neutral; the 3 is the one that separates the 2 and that binds the 2 together! So, this separation that has unification and separation: that means this one here that has 2—is to see the change. You must see everything that rises and falls—that relatively, it’s very hard to see the continuity—where’s the line that to see: where’s the line of rise, where’s the fall? But then why is there rise and fall? —that means they still have separation. Yes? In the moment here it’s rising, but where does it fall? There’s a separation that is reached. For me, I use it — because of the separation and unification there’s DIFFERENCE. But understand, there’s difference, but it’s not judging. You have not named it yet! If you name it, it’s different already (‘this is black, this is white,) Because if you’re matching one and one here—you don’t call it ‘two’-then that’s a difference; if you name it, then you’re using the past to name it. It’s not the same—it’s different. (points to table…) even if it’s the same here, there’s no difference…but even no difference has difference! Under the center, there’s gravity—so based on this gravity and alignment, there’s 3dim, xyz within the space: horizontal, frontal, sagittal: every center has this. This center is related to other centers. Like our center of gravity and the mass are our main centers, but there are all other centers, for example our shoulder joint, our hips, our crown that separates the front and the back has center, what separates left and right has a center. From the center here, you can see what is left and right, what is inside what is outside, what’s open and closed, what is yin yang. So in action, it will be only this: Open and Closed. So, one dimension has open close. Every one dimension has open close. Alright. I’ve said this many times. Any questions? The first thing we start to train within our body is alignment; there’s a center. Every time training must have 2 points—have that kind of relationship. First is the gravity: the gravity becomes our point of contact: our feet standing here, comes into contact with the floor. You must see where is the center of gravity that aligns up—to our top here, to our crown. So, training you want to have this balance point and the feet balance point and the crown balance point, why? That means these 2 balance points don’t change! When these 2 points don’t change, [a reference] it means they keep on changing. In order to be firm with the floor and steady with the floor, you must always be changing with the floor. You keep on changing to balance, to keep on changing with the floor to balance, to maintain. There’s 2 things to maintain: one is the Center and one is the Touch: that means the PRESSURE. When we talk about ‘fear’ (it falls under greed, hate, ignorance—you like, don’t like and don’t know-it’s the same. That’s why we put it into only Past and Present (You trigger the Past—you have fear, hate, anger, greed—you have all this, because you judge!) Present is direct, no judging. Make it simple. We come to train, you already need to understand this. Like Reverend Ji Ru said. You only need to understand this. If you want to go into all this, you will be a scholar; but when it comes to training, direct. From direct here, because of the concentrations… discipline, concentration, and wisdom. DIRECT KNOWING IS WISDOM, it’s not knowledge. Knowledge is the accumulation. Direct is the wisdom. So that’s why I brought you guys here [to MABA temple/meditation halls for retreat] because we need the environment here and also to have the professional like Rev. Ji Ru who can bring you step by step, and this environment to go in and develop that kind of attention. Understand here? So it comes down to attention. With this, you’re able to see the balance point: your job is to be continually adjusting. We are always unstable because of change. To be stable that means a balance point—that means you have to change with change to make it stable. To make it stable that means you can’t be only one side stable: that means you need 2 things together, minimum 2, to make it stable. Because you need a point to be stable in order to have direction. The balance point—the direction comes from the balance point. (I sometime try to explain with the example of the fish: how the fish moves its tail: it’s concave convex, or it’s open and close, and when it whacks its tail, it’s a pivot point, a pivot point is also a balance point. When you do this, and whack the tail in one direction, he goes this way; you hit the other way, he goes the other direction. When you give the direction, only then can the fish swim; if this point isn’t steady, the fish’s head will be shaking. Or if you whack the tail, the fish will keep on going around and around. When the tail gets injured he can’t swim—only go in circle. So every action has a balance point, sometimes we call it also a pivot point. A Balance point is slightly different but it’s on the pivot point. So when we classify it as a pivot, so when this pivot is on the very moment of ACTION, the point itself cannot move: it’s stable. If it moves, it’s not a pivot point. So every time we make a step, it has a pivot point. You hold on to the floor, there’s a pivot point: if the pivot point on that moment can’t hold you fall, slip, slip and fall down. So every action has that kind of pivot point on point of contact That’s why we talk about on point of contact; we have flow, fend, roll and pivot. Like a car, and its running tires. The wheel, it’s point of contact is 90 degrees on the floor. So this 90 degrees is a pivot point, so when it rolls, that moment of rolling, that point can’t slip. So when this pivot point doesn’t move, it changes: but there’s another pivot point, another pivot point, another pivot point. When it changes pivot point we call that roll; we call it a ROLLING changing pivot point. But that rolling point also has the quality of 90 degrees towards the center all the time. So, at the POC, you must produce this 90. on that 90 degree you pivot, you roll and change point. Q: Sifu responds: we don’t talk about ‘memory’. In the moment of training we try to be conscious, to pay attention: the reference is different. If your reference is one of memory, it’s from the past. It’s a habit. Because you are training in the moment to be continually matching, continually changing the point. So that doesn’t need memory. But of course, when you come back to philosophy concept you fall back on knowledge. When it comes to training, throw that away: it’s only on point of contact. (At first, of course, it’s ‘knowledge’, but then you learn to train on the point. The past knowledge is just a pointer—but when you train, only DO the paying attention…if you use direct, it’s different. There’s a feedback energy (we talk about energy: like when you bounce a ball…90) For how you ‘know’ 90 to the point is a FEEL, that experiential feel of the moment to know. When you can capture understanding that—and only that as a center of reference—only then will you know the feel of up down, etc…the direct energy of feeling back (of 2 energies: you drop down it bounces back). You need to RECOGNIZE (not ‘learn’) the law of nature. What we are training, like Rev. said too about meditation, is direct observation with attention. So (recap), the first thing we do is to balance these 2 points first: floor and crown to have these 2 points to bring these 2 in relationship. We’ll work a little bit on these yourself to see if you can understand the 2 balance points for yourself. The Balance Point needs 2 things: yin and yang. Within our body we talk about the 4 elements: air is action and movement. Earth element is the hard objects: skeletons/bone, ligaments, tendons, and tissue up to the skin. The bone is the center of yin yang muscles. Because the muscles attach on all the ligaments and tendons and all movement is on the joints. 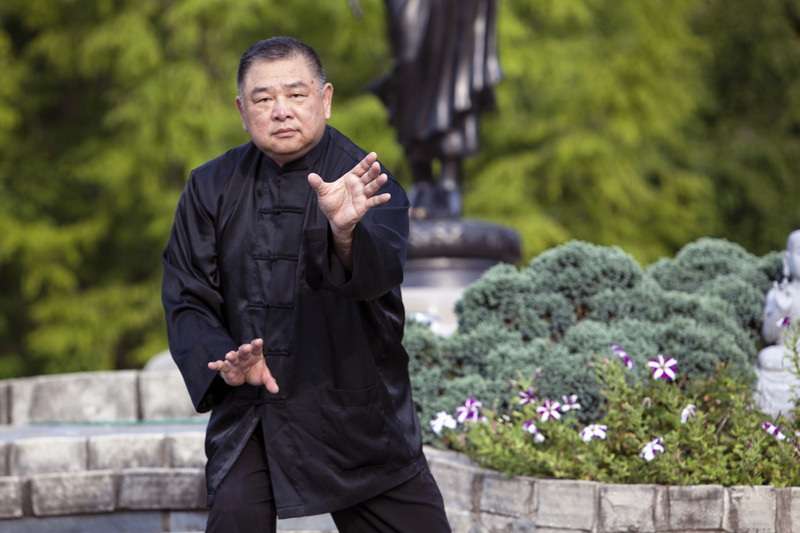 That’s why lots of tai chi talk about 6 harmonies (on the joints), but why some talk about 7 (on the neck—the 7th star): Ankle, knee, hip; shoulder, elbow, wrist—and all the connections up to neck. You must understand that Tai Chi balance is not only this kind of balance (takes out his eye glasses to demonstrate 50-50 balance). Tai Chi is not 50-50; it’s the COMPLEMENTARY BALANCE. It can balance one heavy and one light; it talks about this kind of balance (one long one short). It’s not the same height or same weights being balanced. It’s the balance of black and white—how can you balance that?! That’s why the thing that separates these two must be very strong to hold, otherwise yin will interfere with yang and yang interfere. the neutral must be so strong to hold that they don’t interfere and then they cycle to have the complementary. Of course, they do have this kind of balance, but for example, our muscles do have yin and yang: yin muscles are contracting, yang muscles are expanding. (ever see someone who broke his hand? I broke my hand before—laughs…. There’s nothing to hold in the center—it just collapses. In the nature itself has its function. I call this hardware: you only can grab this way (from yin side), can’t grab from yang side. So you are born as such, as a human being: all the joints you can’t change; it has to work this way. And at action—on Point of contact—I call software: because it can change. Now, first of all I want you guys to do these 2 point—up down, hold the crown to go down, hold the floor to go up. Hold the crown, stretch it down. Drop to stretch it down. That means you must have 2 energies: it’s a cycle. To go through the body you must understand we go through what part of the body? Go down the front come up the back. But when you go down the front, it goes down through 2 different groups—first through the yin then the yang. And coming up the back, also through 2 groups. It comes to the function and follow the nature of the muscles: yin muscles contract, yang muscles expand. Why is that? Relaxation is the balance, according to gravity. Let the breath flow naturally first. Yang is project from ming-men and expanding from the bone out With these movement we call this the macrocosmic energy flow. Attention on the touch. When you are mindful there’s a kind of constant watch on the point, so that from the point you are able to link in. Constant adjusting, constant over there; constant changing, constant in the process. There’s no gap, constant maintaining over there. That’s how you know you are aware over there: attention. It’s not just that you ‘act.’ No, the training is the constant adjusting—the same balance, the same feel. First it’s a constant on the center point. Then the constant of the touch—of the pressure. (you go down, maintain the same pressure on the feet never increase. You come up, never increase the pressure on the feet). That’s why we say you go down it must come from the front. Try it and see – if you go down from the yang/back the pressure drops and you get heavy, you get stuck. Now use the yang muscle and expand fist. Sometime we talk about what comes first. It’s only a matter of WHAT INITIATES first (whatever goes ahead first, the other will back it up!) So you have to balance these two muscles at the same time in order to maintain: That is the constancy of maintaining, of balancing. When you keep on balancing, the attention must be there. Then, if anything distracts or interrupts, or comes to change, you know. That’s why if anything/force increases, then you know. For instance, at the point of contact, if I want 4 ounces of force, but this guy increases 100 pounds, then I know he’s increased force, but I only take 4 ounces. Then the other 100 pounds doesn’t affect me, because I’ve only used 4 ounces: I maintain. This is how you do the balance point. This is why we call this ‘no resistance, no backing off’—what we call FLOW. If you can’t do this flow, you can’t be present. If you can flow to be HERE, only then can you merge, link, connect, get the right information through the balance point. Of course, when I touch I also know, but that knowing is also different. Maintain the same pressure on the changing—that means you’re flowing (sometimes you need pivot or roll to maintain)…sometimes you can’t (if you’re blocked), then you may need to pivot to get the same line or direction. Narrates PROCESS: You want to work so that everything goes out and comes back: rely first on crown and floor (up and down), and dan tien and ming-men (front and back)—with these groups of muscle you have the macrocosmic energy flow. [relax your face first, then your body: keep checking your crown—does your crown lose the pressure or not? If it loses, then your yang’s not maintaining). Relax face, relax shoulder, relax front of body down to dan tien. Stop. Then, form here expand your back. Feel the ming-men to the front (thighs), and relax, drop it to the feet: expand it down to the floor. Feel the hollow—go down to the big toe, wrap around to little toe and draw the hollow up to dan tien…up. expand it to the ming-men and expand it up to the crown. Maintain the alignment and skeleton first. You can see confidence and readiness. (crouching of the cat) – must have the stretching from crown to perineum (to get the return to come up). The crown here—this exercise here: You can keep on training for many, many years; because of this balance point until so steady strong, so precise anything touches you, it can’t affect you (if anyone touches you, they bounce back) because so constant adjusting. Alignment and the skeleton is different. Skeleton and gravity alignment is different. Alignment is form the mass (including flesh and everything). So mass alignment is slightly different, but you need skeleton in order to support it. Triangle energy (two feet up to dan tien) 2 triangles: 2 from feet up to dt. One from ming-men that comes to the front and points from hips going down to balance beam line (wraps around to knee and goes down). These 2 triangles interlock; then, this supports to hold the crown (up and down hold the crown). Find the hip center (where the kua is) and do the condense expand (in all direction). Yin kua is center of the hip; yang kua is the whole pelvis. Your experience or the past can interfere if you’re ‘trying’ to do something. If you try to ‘do’ something, then you’re using your past viewpoint instead of listening to instructions! If your attention is not there, that means you try to do something else. Your body will get into the habitual; that means you’re not training mindfully. That means you don’t know your habit already took over you. Because there’s no way to get out from your old viewpoint unless you listen carefully; listen to the instructions and follow the instructions. If you think, that means you can never get away from your own viewpoint. When you follow instructions, you’re trying to be mindful of the action of how to do it. Following instructions on how to do it is so you can learn to meet on the point. The ultimate move is who is more aware. 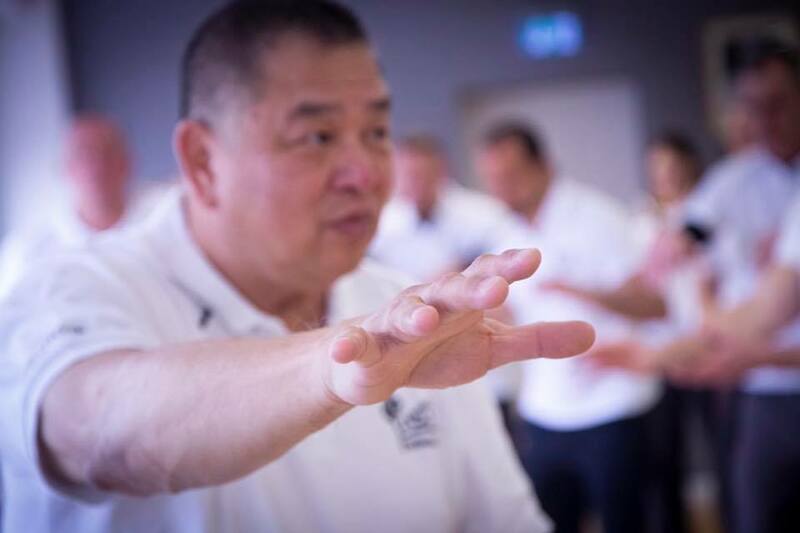 There’s no such thing as ‘ultimate move.’ So what I want you guys to be aware of is to FEEL (so that slowly you’ll be aware that on touch there is a CONNECTING of joints; if you’re not aware of this, then on one touch, you’ll be gone!) It seems so fast, when it’s about ATTENTION. Is my body connected already, then when I meet the point and it’s a fullness point. If my body is already linked, then when you touch me, I’ve already got a fullness point. You have no chance to pull or push because I’m already connected. I’m DIRECT. (what is ‘defense’—direct is just a defense, like a shield, fend off. Shielding energy is fending / defense energy: I meet to this point and I’m like a ball—any part you touch is a ball, the furthest point to the center, the highest point to the center (6 direction). You want to push me, I rotate first… you won’t be able to push; your point won’t have any power. Pull push at the tip. Meet the tip of the force…bring the opponent’s force along. If you don’t have the fullness quality within, you’ll collapse. Meet first! The Zhong Xin Dao system uses the 4 Mindfulnesses in our training. When I was in the Buddhist temple I incorporated this philosophy and concept and process of how it should be trained. So, as you know, my system works tightly with these principles. So, as you go higher you can’t get away from insight meditation. Before I engage in this, I was already quite good in martial arts; but when I listened to this philosophy only then did I open up. I get insight. A lot of times, in olden days, marital artists couldn’t understand the habitual and the awareness or the reflex – those kinds of things we weren’t clear. You always think you have that kind of power; but sometimes we don’t. Sometimes habitually, the reflex was in action. And sometimes we were aware. But we couldn’t distinguish it. Only when we understand the philosophy deep enough could we understand the special kind of quality. That’s why my teaching here is very specific and direct. It’s also within the system, when you go higher, we’ll require you to understand the right mindfulness. Because there are so many mindfulnesses out there; it’s very hard to differentiate. Feel the body. When emotion changes, the breath changes. Everything will affect the breath—how your feeling changes. You have anxiety you breath changes. You feel calm, your breath changes. Keep attention on attention. Keep on feeling and balancing things. Meet the flow. Practically speaking, everything is about balancing. Don’t listen to only one thing. Balancing is the present, balancing is the center, balancing is formless, neutral, empty. A lot of qualities within. How do you see what is balance?